I would like some of your thoughts on the design. My plan at this point is the have an indoor walk way where the indoor dog kennels will be. Right now, I plan for this space to be about 10 X 21 feet with about 4 X4 ft indoor kennels for the dogs to get in out of the weather. 1. I was wondering your thoughts on drains. How big of a deal do you feel having drains are to transport the occasional water to the outside of the building? I am kind of thinking a couple of drains with the cement slightly sloped towards them would be handy. Small drains inside each 4 x 4 kennel or a couple of bigger drains outside of the kennels that the water flows into? I have talked to a couple of people who say that their dogs never use the restroom in this space and always go outside. 2. 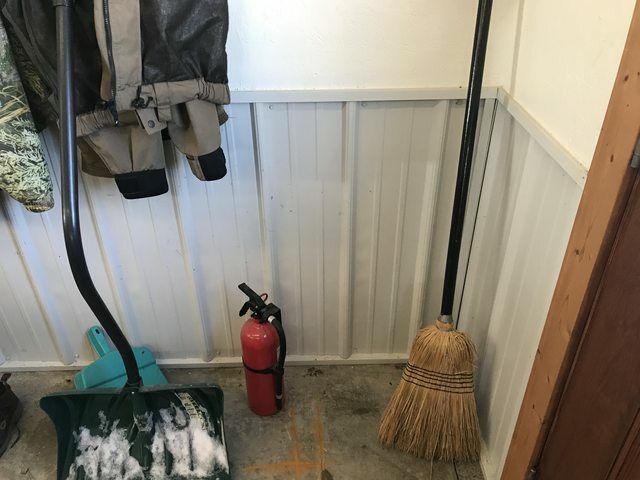 I am planning to use spray foam insulation to insulate this space, but I kind of need the walls to be somewhat water proof at least a foot or so up from the floor if I want to spray things down a little. Would would you use to cover the walls on the lower part of this space? 3. There is stuff that can be mixed into the cement that will make it where water/urine can't penetrate the cement as well. Would the extra cost be worth it. Don't know the cost at this point. I plan to make the outdoor runs with a 4 inch slope away from building for easy spraying and run off. I will also make this cement as smooth as possible for easy clean up and spray down. The outdoor runs will be about 4 x 12 ft each. Any ideas would be appreciated. Once its done, its done, so I want it to be done right and to serve me and the hounds well for, hopefully, many years. Having smelled dog urine indoors I would definitely design the kennel so that it can be hosed down and the water drained off and any additive that would prevent the urine from soaking into the floor would be worth it to me. In everything I have bought or built I have never regretted spending the money to do things right. I finished my concrete in the outdoor part of my runs with a slightly broomed finish. I think it is better on the dogs feet and I am too old to be slipping and falling on slick concrete. I have tremendous water pressure on my hydrant beside the kennel so blowing the floors off is easy. I put a peaked roof over my outdoor kennels and it saves me alot of snow shoveling and the shade is nice for the dogs. Electrical outlets and a large metal ceiling fan on a switch as well to move air in the summer and heat water in the winter. I built the walls in my shop using this setup so I can hose it out. The upper walls are painted OSB over spray foamed walls. I would do all of that the same if I ever build another one. I have seen some beagle guys use a raised kennel door, leaving about a foot or so of solid kennel below the door. It keeps the beagles from bolting out the door when it is opened and if a guy was planning on having any litters I think it would be really nice for the same reason. I have also seen some commercial boarding kennels which used cinder block walls partially up the kennel walls to block the view of the dog next door and makes blasting out kennels while still being able to direct the water, easier as well. Might think about that for one of your runs perhaps. How often will the dogs be let out of the kennel for exercise? They can go 12 hours or more without having to relieve themselves. Concrete isn't joint friendly. 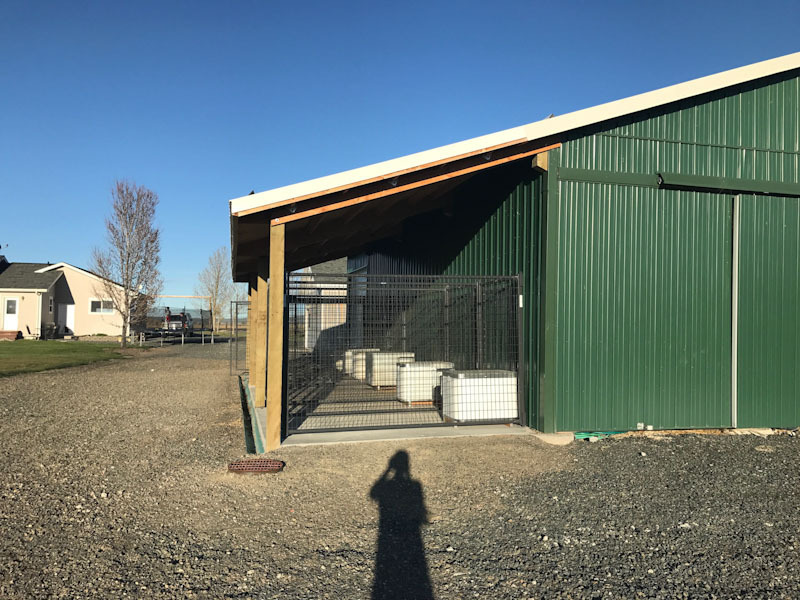 My outside kennel has a layer of Visqueen over the ground, cyclone fencing on top of that to discourage digging, and about six inches of pea gravel over that. None of my dogs ever developed calluses. The dog is exercised twice a day and doesn't poop or pee in the kennel unless something's wrong. Pee is washed away by the rain so there is never a urine smell, and feces can be easily scooped off the pea gravel. Thanks for your thoughts. Is your's built with a door for your dog to go outside at will or is your outdoor kennel separate? The picture helps me get an idea how you did things on the wall. It appears that you used sheet metal extending to the ground. I assume you have the same sheet metal on the outside, then spray foam, then the OSB board, then the sheet metal again. Does the OSB board extend all the way to the floor or does it stop where the Sheet metal starts? I assume you put some sort of drain in and can spray water as needed in there without fear of messing up the insulation? What type of drain did you use? More pictures? Is that image of the inside portion of your dog kennel? Also, you mentioned that this was a part of your shop. I am building a shop as well. I'm trying to decide whether to do a lean-to outside of the main shop, but attached to it with a door to enter it from the main shop or to just wall off a portion of the shop itself for the indoor portion of the kennels. What did you do? The latter would save quite a bit of money due to needing less cement, but it would take up shop space. I know I have lots of questions. You seem happy with your design, so I am intrigued. I live in the country where there are only 6 houses on a mile square, and my dogs get to run free a few hours per day if they are not in heat. Planning to have more females and having to deal with more females in heat I will need to build a fenced in area and I may consider doing something for that area that you have done with your kennel area. Thanks for the ideas. As for my kennels now, which are made of 2 x 6's and have lasted over a decade with the occasional staining I have a cot inside for laying on, which seems to help. I plan to have one for the new kennels. Maybe one for the inside and one for the outside as well. My vet lined the walls of his indoor kennels with this stuff. It is commonly used in dairies where cleanliness is important. Comes in sheets or rolls and in different thickness. Corners and other trim pieces are available. If you are planning on raising litters I wouldn't use anything porous unless you disinfect regularly. For puppies I think the above ground kennels are much better. Kennel floor concrete should be a light broom finish with a minimum slope of 1/4" per foot for drainage. If you use cement block wall dividers you should paint them with epoxy paint to seal the texture. Not much of a problem with females but with males the cement blocks will hold urine. I have seen kennels with the polymax board attached to the chain link for dividers. Cheaper than having cement blocks and having to paint them. Better figure out a way to get rid of the waste also. My kennel is connected to my sewer. I have a trough at the back that is the width of a square shovel. The drains covers are slotted to allow water and urine to drain during the day and I hose the waste down in the evening. If your kennel is going to be attached to a building your trough will have to be at the front. Not the best but I have seen them that way. You will need a frost free faucet nearby too. Here is my setup. I use the Dog Den kennels and cover the pens with shade panels in the summer. Didn't want the urine smell in my building. Terry, when you say a lifted deck for puppies may be better, do you mean the plastic type sections that can be bought and put together? I assume those can be placed on top of cement? Also, I’ve wondered about the urine smell. Im wondering if that would still be a problem if I make the inside kennels pretty small. 4 X 4, for example. It seems they would be inclined to go outside. What do you think? Am I reading that website right? One 4ft x 8ft x 1/2" sheet of PolyMax board is nearly $200?!?! I can't imagine spending the $ to cover all of the walls in a dog run at that price. The 3/16 thickness is plenty....maybe 1/4 inch if used as dividers but have to be attached the fence. I've been able to get large sheets of plexiglass free from sign shops. They take down old signs and can't reuse them. Of course they have things painted on one side, but the dog can't read, so he's ok with it. JT3, here is a photo of my current kennel setup. The dogs enter the inside of the machine shed through holes in the wall. The chain link kennels include an end which is butted up to the standard painted metal siding on the Machine Shed. 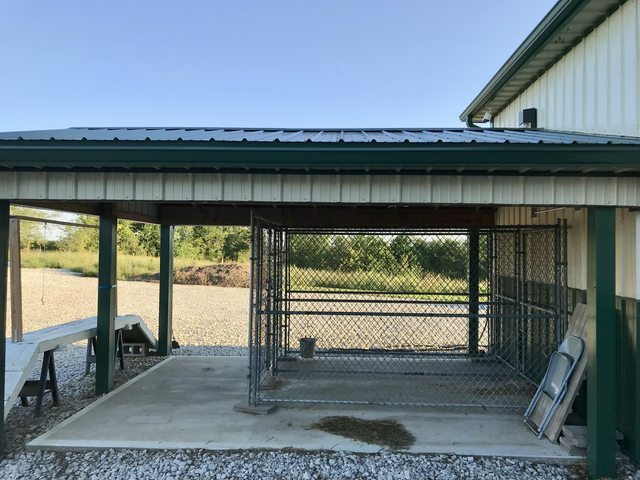 The entrance from the end of the outdoor kennel into the machine shed is fully flashed with bent edges metal trim materials so no sharp edges anywhere. I used standard floor drains with piping to drain away to daylight away from the building running underneath the floor and footings before they were poured. I have a CRP field 20 yards from my kennel and just sling any solids out there, which I understand is not an option for everyone. I started a similar thread around 3 years ago before we built a more permanent solution below. This was also an "add-on" to an existing barn. A few things we did, or have learned along the way. 1) I much prefer wire panel kennels to chain link, although they are more expensive. We had chain link years ago along with a few escape artists that continually worked it to escape. A dog that only knew good chain link would probably be fine, though. I put tops on two runs for extra security when having someone else's dog, dog in heat, etc. Runs are 5'x10', with one 10'x10'. 2) The K9 Condo Dog Den II kennels have lasted a LONG time and we like them. 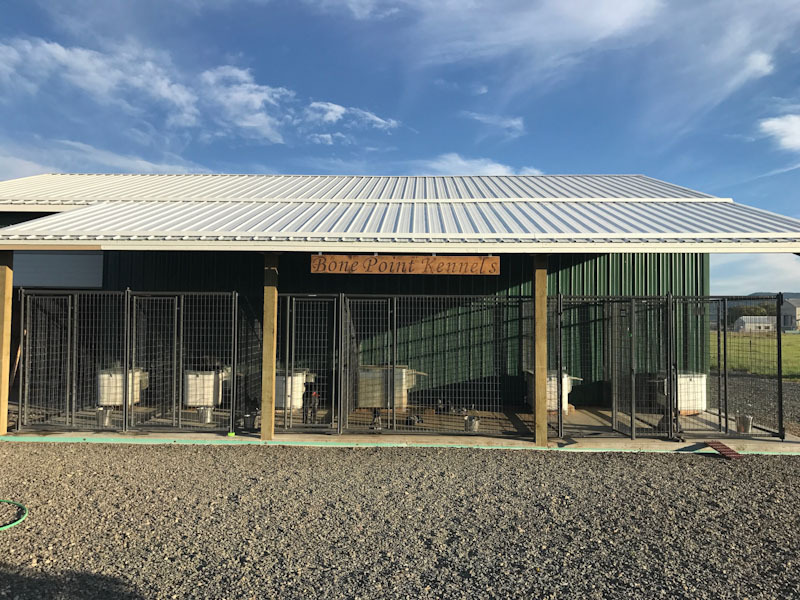 We use the large, and have an extra large in the 10'x10' kennel that can be used for puppies or two young dogs. I have heard the Lifesaver dog house is also nice, but never tried them. 3) Our concrete is sloped to the drain in front, which drains to a the local hole on the end with the grate. This works fine, although it would be easier to spray out if it wasn't up against a barn. I scoop solids twice a day and do not flush them down the drain. So mostly urine and water from spaying out once per day. During winter, I just scoop solids and don't spray because everything is pretty well froze up for 3 months. I did not originally like the drain in front and was going to add a grate over it, but I got used to it and so did the dogs. I usually keep a grate over the puppy pen door, though. 4) I did not add a gutter since we are in a pretty dry climate, but I do get tired of getting dripped on for 2 months from snow melt. Not a bad idea, then run it into the top end of the drain to flush it. 5) I had intended to put a sealer on top of the concrete to minimize urine penetration, however, we did ours in the fall and the contractor felt it was too cold for the sealer. I never went back and took everything off to seal it. It doesn't stink, though. But, I would seal the top if you can. There is a kennel cote product, but most contractors can get local stuff that is similar and should work fine. 6) We did smooth finish, not broom. Smooth is slick when its wet, but better than feces getting stuck in broom grooves (think disease). Concrete is sloped to front. I forget the pitch, but it was the same they use on sidewalks. I would that or a little more. Going forward, I will spray kennels once a week, and daily when we have puppies. 8 ) I plan to eventually do an indoor/outdoor setup and go inside the barn. 5'x5' is big enough inside so they don't pee or crap. I will also go with a gated panel inside, so I have access from inside the barn where I have a training table for winter FF training. 9) As Coveyrun mentioned, having a way to keep the puppies elevated and from laying in a mess is a good idea. A litter of 10 will make a huge mess in between morning and evening cleanings. Throw a Kuranda bed in the puppy kennel. The adult dogs are fine laying on top of their dog house, although a Kuranda bed wouldn't be a bad idea if the run was bigger than 5'x10'. 10) If you put a door for barn/shop access, Scotts makes one with a nice seal and spring action. The K9 Condo doors (same as the dog house) are not as weather tight, if that is a concern. Good info KJ.....I second the use of wire panels if available. I've seen a SM destroy a chain link fence kennel. Didn't have many teeth left and the dental bill was expensive. The problem is most of the box store chain link kennel panels are made from 14 or 12 gauge wire. Residential fence wire is usually 11 gauge. I had my kennel panels made by a fence contractor and requested 9 gauge wire. Might cost a little more but the only one I've had escape went over the top. He would get on top of the dog house and climb over in a corner. A cattle panel across the top fixed that. x2 on the 9 gauge chain link kennel. Mine has lasted 25 years so far with no signs of giving up. And x2 on putting a roof over the top if you are concerned about a climber. Before I had the indoor option I put my dog houses at the outside end of the kennel run and wired them to the kennel so they could not move. It prevented a dog from getting on top of the dog house and using it as step ladder to go over the top of the wall. I have two Dog Den 2 dog houses. They are ok. These are better and what I use now. They have a swinging door entrance into the nest box and do a much better job of keeping drafts out and the divider comes out in the summer. AverageGuy wrote: .....These are better and what I use now. They have a swinging door entrance into the nest box and do a much better job of keeping drafts out and the divider comes out in the summer. Did you seal the wood interior with polyurethane? Was wondering how it would hold up against moisture.